A missing tooth can impair the function of your mouth, making eating, drinking, and speaking more difficult. From an aesthetic standpoint, a missing tooth not only leaves a gap in your smile, but can also allow the surrounding teeth to shift position, eventually leading to functional bite issues. When cosmetic dentist Colin Morton, DDS replaces a missing tooth, he can do more than simply revitalize the beauty of your smile; he can restore the integrity of your bite, help you regain lost functionality, and prevent more costly repairs in the future. To do this, he utilizes dental implants. Dental implants offer an innovative method of tooth replacement that can provide stable, durable, and natural-looking results. Dental implants are designed to look and function just like normal teeth. They can also be brushed and flossed just like natural teeth. In addition, since dental implants are securely held in place, you can avoid many of the common complaints patients have about traditional removable dentures, such as slippage or gum irritation. Dental implants have given many of our patients a healthy, younger-looking smile and improved the overall quality of their daily lives. During a consultation at our practice, Dr. Morton can evaluate your specific needs, goals, and oral health to determine if dental implants would be an appropriate tooth restoration option. If it is decided that you are a good candidate, he will discuss the intricacies of the procedure in full detail, allowing you to make an informed decision about whether or not you would like to proceed with treatment. In the event Dr. Morton determines that you are not a good candidate for dental implants, he will recommend potential alternatives that can help restore the function and aesthetics of your smile based on your unique situation. At our practice, Dr. Morton offers dental implant options to replace a single tooth, multiple teeth, and even a full row of teeth. The information below can help you determine which type of implants may be most appropriate for your needs and smile goals. Single-tooth implants can be an excellent solution for the replacement of individual teeth. With this option, an implant post is anchored into the jawbone in the area vacated by the former tooth, and a dental crown that is shaped and colored to blend seamlessly with adjacent teeth is fixed to the tip for a natural-looking result. For individuals who have three or more consecutive missing or damaged teeth, multiple dental implants may prove to be an ideal option. Depending on how many teeth are being replaced, anywhere from two to six implant posts can be secured in strategic positions along the jawbone in order to hold a multi-tooth restoration—such as a dental bridge, partial denture, or full denture—in place. Traditional dentures and partial dentures can be inconvenient, messy, and even embarrassing. Though they are intended to help you regain the ability to speak and chew, many patients complain about their lack of confidence with traditional dentures since they can shift around or “drop” while they are speaking. However, by using four (All-on-Four) to six (All-on-Six) dental implants per arch to secure a denture or partial denture in place, many of these inconveniences can disappear, serving as a cosmetically appealing, more stable, comfortable form of tooth replacement which will allow you to be more confident in social situations. The dental implant procedure is performed in two stages. First, a titanium post is implanted in the gap left by the missing tooth to serve as a durable artificial “root.” These posts should gradually fuse to the jawbone, which allows dental implants to serve as a strong and long lasting form of tooth replacement. In many cases, temporary crowns may be placed directly on the new implants to fill in the spaces while the implants heal over several months. Once the fusion of the titanium post is complete, a custom-made crown is affixed to it. These crowns are designed to fit seamlessly with your other teeth, matching the shade and shape of your smile for an inconspicuous and natural look and feel. The actual dental implant post generally becomes a permanent part of the mouth with proper oral care—this includes brushing and flossing on a daily basis, as well as scheduling routine checkups and cleanings as recommended by your dentist. The custom crown, denture, or other restoration secured to the top of the implant(s) can also provide long-term results when appropriately cared for, typically lasting many years (and sometimes even decades). The cost of dental implants will depend on numerous factors specific to each case, including how many implants are placed, what type of restoration is utilized, and whether or not any treatment—such as periodontal care or bone grafting—is required to optimize oral health beforehand. For more specific information about what comprises the price of dental implants, please click on the button below. For patients who are not considered good candidates for dental implants, or for those who simply prefer another tooth replacement option, Dr. Morton offers several alternatives to dental implants that can restore both form and function to the smile. Traditional dental crowns can often be a good option for “capping” a damaged or decayed tooth that does not require extraction. In the event tooth extraction is necessary, a traditional dental bridge can be used to fill the gap left by a single tooth or multiple adjacent teeth. Dr. Morton can discuss these treatments—and any additional options—with you in full detail during an appointment at our practice. We want everyone interested in dental implants to be as well-informed about treatment as possible in order to make the best decision for their unique oral needs and goals. To help accomplish this, Dr. Morton and our team host a number of dental implant seminars throughout the course of each year right here in our office. These educational meetings provide a perfect time to learn directly from Dr. Morton and our staff, ask questions, and gain a full understanding of the dental implant process in a relaxed and comfortable environment. For more information, please follow the link below. 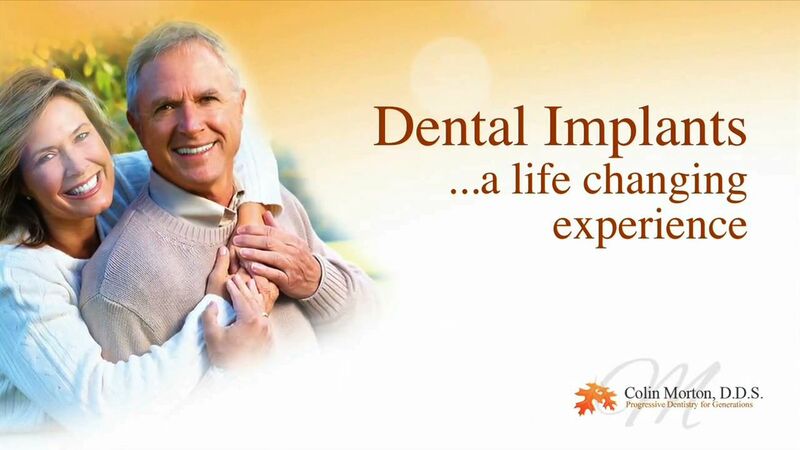 If you would like more information on dental implants, or to schedule a consultation, please contact us today.